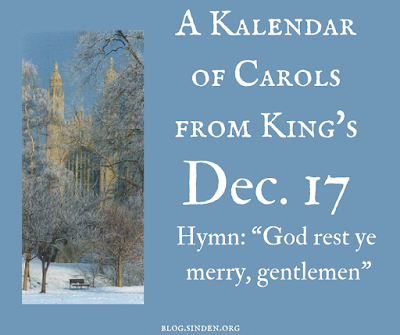 2017 Festival of Nine Lessons and Carols: Hymn: "God rest ye merry, gentlemen"
Sinden.org published its traditional preview of the music list for the Festival of Nine Lessons and Carols from King's College, Cambridge late last month..
For the days leading up to the service, we have been offer a Kalendar of Carols: a more in-depth look at each piece of music to be sung. So far, we've covered the opening hymn, Bidding Prayer, In the bleak mid-winter – Harold Darke, Adam's Fall – Richard Elfyn Jones, Love came down at Christmas – arr. Stephen Cleobury, How shall I fitly meet thee – Bach, I saw three ships – arr. Ledger, Illuminare Jerusalem – Judith Weir, and the hymn "O little town of Bethlehem", A spotless rose – Herbert Howells, The Lamb – John Tavener, The Angel Gabriel – Pettman, The Linden Tree Carol – arr. Cleobury, this year's commissioned carol by Huw Watkins, and Can I not sing but hoy – Francis Jackson. 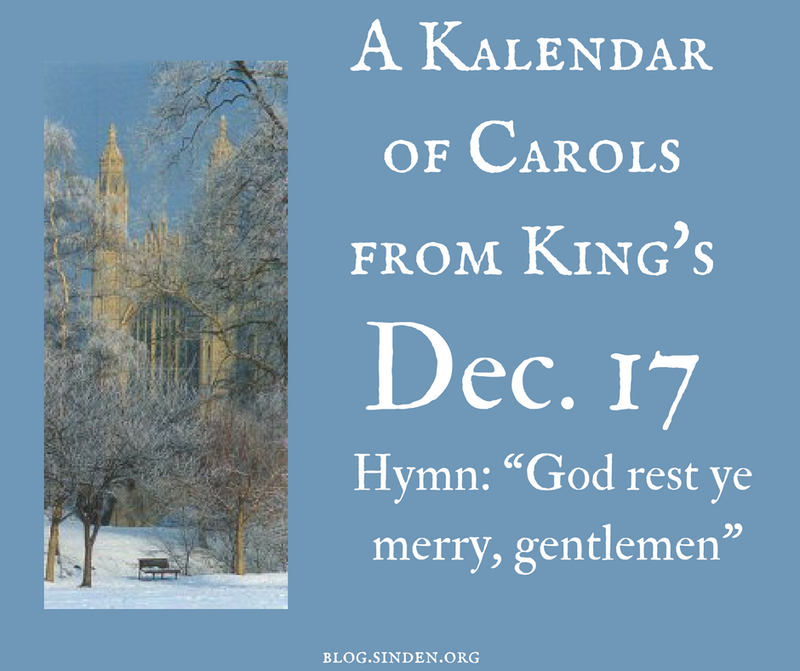 "God rest ye merry, Gentlemen" is already a fantastic carol (hymn?). And in David Willcocks's fabulous arrangement, it's even better. I find it a bit curious that the word "ye" appears in the title of this carol (and it's written this way on in the note on page 48 of this year's service booklet), but at least as far back as 1998 it has always been sung "you", as in "God rest you merry, gentlemen". The short intro of the first phrase played on what sounds like the Choir Tromba is a hallmark of the singing of this carol at King's (listen here). At least, it's usually introduced that way. It has also been harmonized recently (listen here). It has also been introduced just on 8s and 4s (listen here). But this quick intro is a reminder of how little we need to give for congregations to join in the singing of a familiar carol like this. Then after that, the second stanza sung by the choir is a splendid thing. Likewise the fourth stanza. Certainly, the full congregation could sing the whole thing all the way through. But it gives the hymn (carol?) a nice texture, lets the words speak more intimately, and lets the Willcocks harmonies have center stage. Also, thinking about the perspective of the congregant, there's something so magnificently visceral about joining in the refrain after a stanza in harmony like that. It also sounds rather satisfying on the radio, which is a real consideration here. The three-part descant is marvelous. And such restraint for it not to continue into the refrain. It's as we had after the a capella stanzas of the hymn, a visceral re-joining. It is surely a contender for best Willcocks descant. Oh, by the way, it's sung a lot at this service.